Onion kichel is a wonderfully savory and peppery snack that's a great accompaniment to cocktails or just for general salty snacking. Substitute these for potato chips, corn chips or other commercially made fried snacks. In a large bowl, mix the onions, eggs, vegetable oil, salt and pepper by hand. Put the flour and baking powder into the bowl of a stand mixer and use the paddle beater to blend at lowmedium speed for 1 to 2 minutes. Add the onion mixture and continue mixing until the flour is well hydrated. Switch to the dough hook and knead for another 5 to 6 minutes. The dough will be stiff and slightly sticky. Turn the dough out onto a well-floured work surface and knead for 2 to 3 minutes, until it no longer sticks. Cover with plastic wrap or a damp cloth and let it rest for 20 to 30 minutes to relax the gluten. Roll the dough out to a thickness of about 3/4 inch using additional flour as needed. 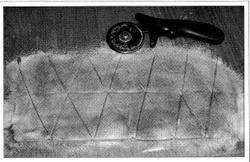 With a sharp knife or a pizza wheel, cut the dough into 1-1/2 inch squares (or triangles) and arrange on a parchmentlined pan about 1 inch apart. Prick each cookie several times with a fork. Bake for 15 to 20 minutes until the onion is a golden brown. Remove to a rack and let cool. These kichel get better after two to three days, but chances are they won't last that long. Note: a pizza wheel is the ideal tool for cutting sheet of dough.